Attendees of the 7th Annual IM4US Conference are invited to attend a Networking Reception & Poster Session immediately following the conference on Friday, August 25th. This event honors the work our conference attendees are doing to bring integrative medicine to underserved communities and showcases emerging research in integrative medicine. It will be an opportunity to meet new people, learn about integrative medicine research, and hear live music by one of Chicago's most vibrant and inspiring ensembles. Conference attendees are granted free entry to the reception but please kindly RSVP by August 15th. Paid tickets are also available for guests of conference attendees and members of the public who are interested in learning about integrative medicine. Guest Tickets are $25 online and $30 at the door. So Chi Voices (South Chicago Voices) is a musical movement committed to uplifting our community through music. Their mission as a collective of artists is to introduce progressive change and positivity to the community. 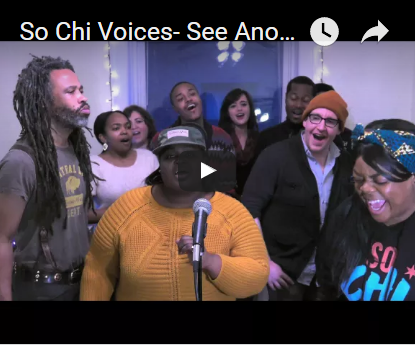 Through a mixture of original songs and cover tunes, So Chi Voices blends the styles of hip hop and R&B into a massive sound that energizes crowds of all sizes. The reception is located at the conference venue, Feinberg Pavilion at 251 East Huron St. Take the escalators to the 3rd floor and the reception will be on the left as you enter the event space. Parking is available for a fee. Please consult the Northwestern Memorial Hospital website for details. Ticket sales benefit Integrative Medicine for the Underserved, a project of Tides Center.